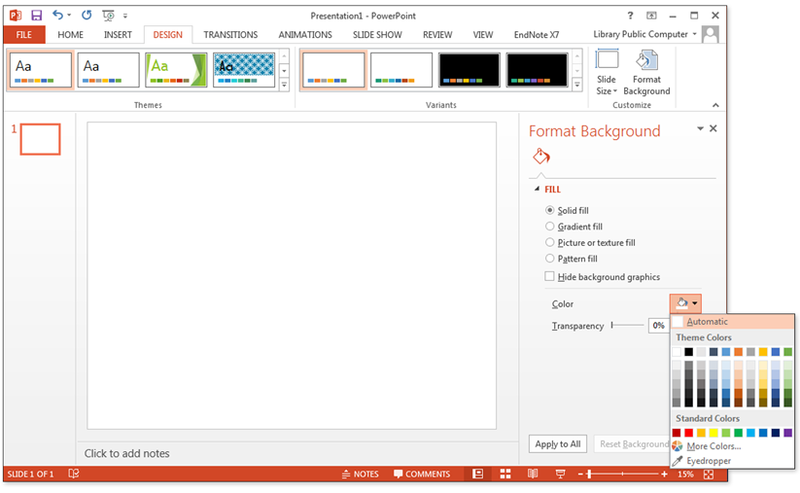 Microsoft PowerPoint was originally designed for created slide presentations, not posters. But it can also be used to create a poster. When you create a poster with PowerPoint, you are creating the poster on only ONE slide (a very large slide). NOTE: PowerPoint for Windows versions 2016, 2013, and Office 365 are very similar. This section applies to both. Screenshots from the 2013 version may differ slightly from the 2016 version but most features work the same way. 1. 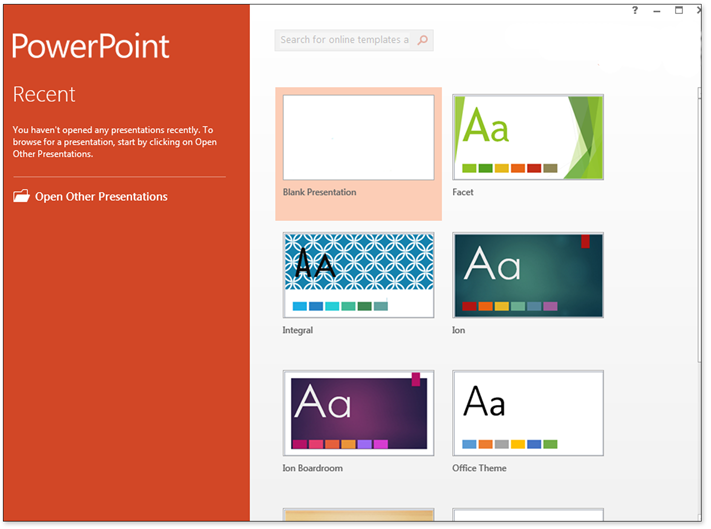 Launch PowerPoint by clicking its program icon. Choose a template, or start from scratch by selecting Blank Presentation. 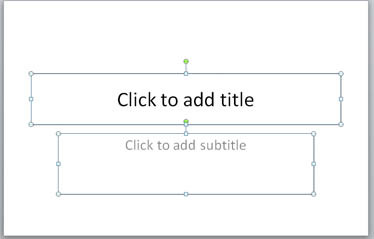 When you start a new presentation, you may see default text boxes in the slide window. These boxes are used for the title slide of a presentation. You don't need them, so delete them by selecting them with the mouse cursor and pressing the delete key. 2. To specify the dimensions of the poster click the Customize icon under the Design tab. Then click Slide Size. 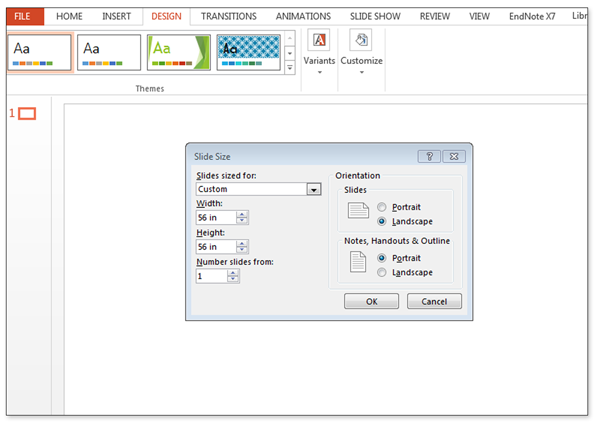 In the Slide Size dialog box, enter the Width and Height for your poster. Be sure that the printer you plan to use is able to print at the size you specify. The maximum slide size in PowerPoint is 56 inches x 56 inches. PowerPoint 2016 slides are, by default, 13.333 inches wide by 7.5 inches high. The standard size for academic posters is 48 inches wide by 36 inches tall. Keep in mind that if you are creating your poster at half-size, everything in it (text, heading, charts, images) will end up being twice as large in your finished poster. So, for example, if you create a title that has a font size of 48 points, in the final poster it will be 96 points. If you want to use a background color other than white, you can change it. Click on the "Design" tab, then click "Customize" and "Format Background." Choose a light color so that your text is easy to read or change the color of your text to a light color so it will appear clearly on a dark background. If you are using the Mac version of PowerPoint, please click here to view the same guide but with images that were taken from a Mac. 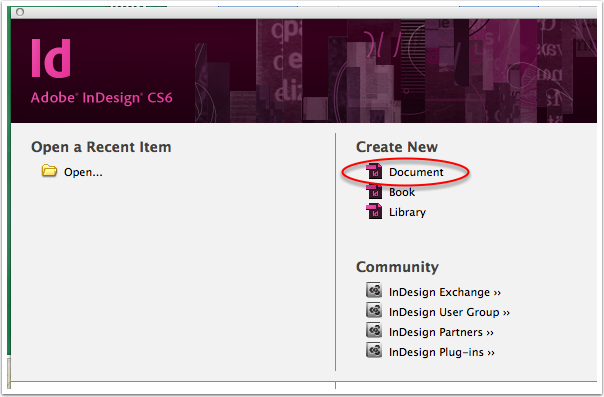 This section describes Adobe InDesign version CS6. If you have a different version of InDesign, the user interface may look a little different but the procedures for creating posters are essentially the same. The user interface of InDesign is essentially the same on the Windows and Macintosh platforms. For information and tutorials about the latest features of Adobe InDesign, see http://www.adobe.com/products/indesign.html. To create a new InDesign document, you can click Create New Document on the splash screen that appears (unless disabled) when InDesign launches. The New Document dialog box appears. Enter in values for the page size, margins, and number of columns. The following example shows values typical for a poster. 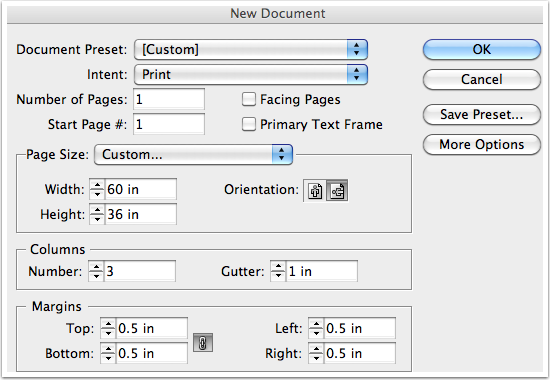 Note: If the measurement units in the above dialog box are something other than inches, you can change the units to inches by choosing InDesign menu > Preferences >Units and Increments. While you are zoomed in, use the Hand tool ( ) to move around the image. Guides are useful for aligning the elements in your poster. Guides are lines that appear on the screen but do not print. To add guides, first make sure the rulers are visible (View menu > Show Rulers). Then click in a ruler and drag to where you want to place the guide. To hide or lock the guides, choose View menu > Hide Guides or Lock Guides.